Sadly, Vocalia doesn't greet you with a hollow "Good morning, Dave"
Despite being an altogether sleeker package, there's not that much the iPhone 3GS has that owners of earlier models don't get with a firmware upgrade. One thing that is 3GS-only is Voice Control, the system for interacting with your iPhone with voice commands. With Vocalia, however, you can add this feature – in theory – to any iPhone or, so long as you add an external mic, the second-generation iPod touch. It has three modes, Contacts, iPod and Bookmarks, along with a big HAL-like eye that blinks as you speak into the mic. 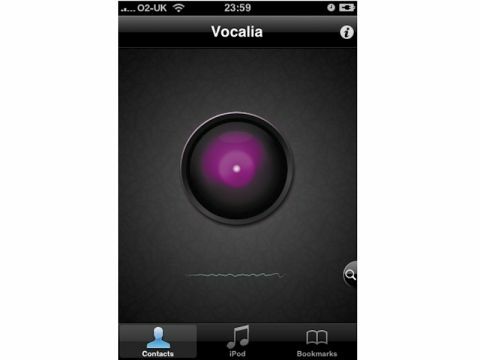 Now, speech recognition is difficult, but Vocalia makes a sterling effort at getting it right. So the tech works reasonably well, but there are problems. The Bookmarks mode requires you – thanks to limitations of the SDK – to manually export then upload your web bookmarks; there's no tie-in with Safari. Worse, part of what makes Voice Control useful is that it's launched with a hardware button, making it safe to use for, say, voice dialling while driving. You need to look at the screen to use Vocalia, and thanks to another Apple limitation, even when you've found the number to dial, you have to manually tap a button on-screen. We're impressed with the technology in Vocalia, but it's hard to recommend it when the benefits of Voice Control are, for most, negated by the fact that you have to interact with the screen.